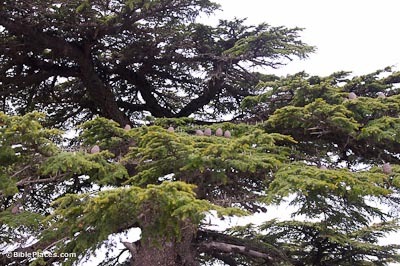 The cedar of Lebanon (Cedrus libani) was prized throughout the ancient Near East. The Palermo Stone indicates cedar was imported to Egypt in the reign of the 4th dynasty king Sneferu, ca. 2613-2589 BC. One of its primary uses was for boat construction. The Egyptian tale of Wen-Amun, from ca. the 11th century BC, recounts the travels of an Egyptian official to Byblos to negotiate for cedar wood. One of the earliest references to cedar in Mesopotamia comes from the reign of Sargon of Akkad, ca. 2334-2279 BC. Commonly referred to in Scripture as the cedars of Lebanon, this aromatic, durable wood was highly desirable for building in Iron Age Israel. David used in it building his palace (2 Sam 5:11; 1 Chr 17:1), and Solomon used it in the construction of the temple and a palace for himself (2 Chr 2:3-8). He was said to make the cedar as plentiful in Jerusalem as sycamore-fig trees in the Shephelah (2 Chr 1:15). The second temple was also constructed from cedars (Ezra 3:7). Over the centuries, the cedar forests of Lebanon were severely depleted. The government of Lebanon is taking steps to replenish the forests and has established cedar reserves. 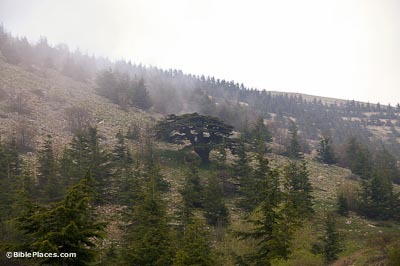 The Esh-Shouf Cedar Reserve was established in 1996, and is the largest of Lebanon’s nature reserves. The reserve is comprised of oak and juniper forests, as well as three cedar forests: Barouk, Maasser Al-Shouf, Ain Zhalta – Bmohary. The cedar forests in the Esh-Shouf Cedar Reserve make up about 25 percent of all remaining cedars in Lebanon. These giant, beautiful, evergreen trees grow in mountainous regions, at altitudes of 3,300-6,500 feet (1,000-2,000 m). They can be found in Lebanon, south-central Turkey, and Cyprus. They produce cones which grow on top of the branch. The trees can attain a height of 100 feet (30 m) and the trunk may reach 6 feet (2 m) in diameter. 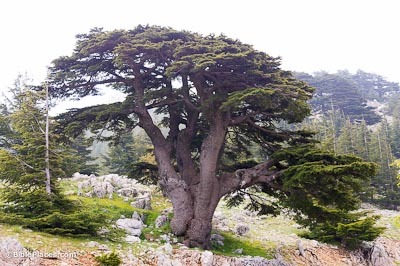 Compared with the trees of Israel, the cedar is indeed a mighty tree, and it is highly praised in Scripture. 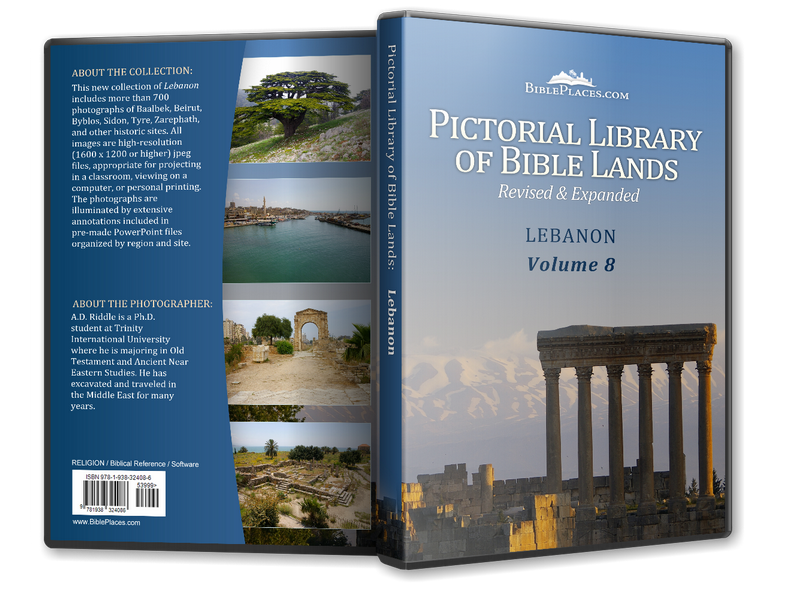 Download all of our Lebanon photos! Lebanon Cedar Tree (20-20 Site) Provides statistics on this tree species and describes where it grows and how to identify it. 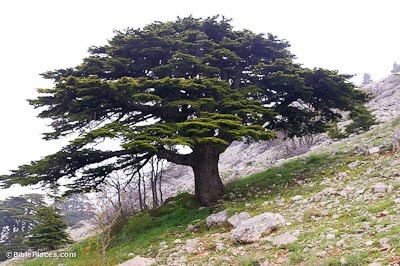 The Cedars (LebanonEguide.com) Describes the Cedar of Lebanon and its history, and links to other pages about the tree. Shouf Cedar Reserve Official website for Lebanon’s largest nature reserve.